Robert was born at 43 Jackman’s Place, Letchworth, Herts on 29th September 1923 and baptised at St Michael’s, Norton Way South, Letchworth. He was known from a very early age as Bob. In c.1928 Bob went to Hillshott infant and then Pixmore junior school in Letchworth and, at the age of 7, he started to study the violin under Miss Tudor Pole - a well known violin teacher based in Letchworth. As a young boy he was a member of the St Michael’s Church Choir and later joined the Church Lads’ Brigade (St Michael’s Division). Bob went to Letchworth Grammar School in January 1935, obtaining his School Certificate in 1939 and leaving in that year, at the age of 16. He was a member of Gorst House and, although a keen sportsman, his greatest love was music; the Grammar School In Memoriam Book states that it is in these fields “his friends will best remember him”. Bob was an accomplished violinist when he left school. On 13th November 1939 Bob started work at the Midland Bank in Letchworth on the princely salary of £50 per annum. He remained with the bank until 1941 and while there studied at the Metropolitan College, St Albans, for the Institute of Bankers Part I, which he passed in 1941. Bob’s sister, Linda, records that she cannot remember Bob very clearly before he left home in 1941. He teased Linda dreadfully and she remembers that she was always in trouble for screaming while he always escaped retribution. Linda further recalls that Bob and Muriel were closer in age and had their music in common - she was probably a great nuisance to them and they probably had to baby-sit more than they liked. In 1941, at the age of 17, he volunteered for flying duties with the RAF and was recommended following evaluation on 21st August 1941 and selected as a candidate to Aberdeen University under the RAF Scheme for potential officers, which he started on 9th October 1941. He matriculated, obtaining his inter BSc, in March 1942; subjects studied were Mathematics and Natural Philosophy (Physics). While at the University Bob had flight experience with the University Air Squadron. Bob was 5.9˝ tall with dark brown hair and brown eyes. On matriculation he was boarded on 20th June 1942 and recommended to undergo training as a pilot, posted to Canada on 2nd July 1942. He arrived for training, initially as L.A.C. Owen R.J. No. 1395251, at Monkton, New Brunswick on 12th July 1942. He was stationed with 2 Squadron No. 31.P.D. RAF Monkton. On 14th September he was transferred to Course 64. 32 Flying Training School at RAF Bowden, Alberta where he started instruction with Stearmans and Tiger Moths, obtaining his wings as a Sergeant on 19th March 1943. He received a temporary commission as Pilot Officer, on 25th November 1943 and went to No 2 Flying Instructors School, RCAF Station, Vulcan, Alberta; his service number becoming 171378. 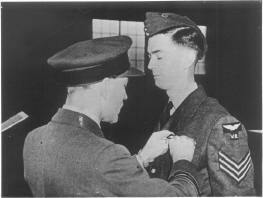 On 2nd June 1943 he moved to the Central Flying School, Carberry, Manitoba as a flying instructor. 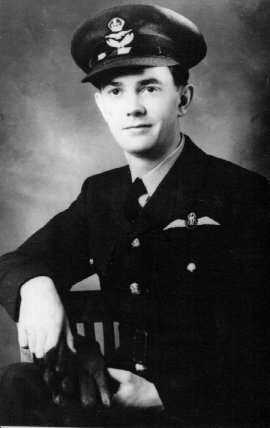 On 25th May 1944, Bob was promoted to Flying Officer and in July 1944 he moved to the Officer Training Unit at Debert, Nova Scotia to take a conversion course on Mosquitoes and then as First Pilot trained with Pilot Officer Thirwell until September 1944, when they both returned to England. Clare Farrar, whom Bob met on one of his many trips to the United States and to whom he became very attached, wrote on 15th June 1991 “ Bob was truly immersed in classical music. I remember his joy in speaking of the trios he played with Muriel and his father, their love of Mozart particularly (While in New York Bob purchased a score of ‘Don Giovanni’ as a wedding gift for Muriel). We attended the old Metropolitan Opera several times, ‘The Magic Flute’ (more Mozart!) and Debussy’s ‘Palleas at Melisande’ which reminds me of Bob’s interest in Medieval History. He explained his views on the Anglican Church and Catholicism when we visited the Cloisters, a French Monastery which had been transported and rebuilt in NY by the Rockefeller Family. This was my first introduction to the beautiful formal gardens and Unicorn tapestry. We toured the Metropolitan Museum of Art with its ancient and modern treasures and also the Frick Museum, an exquisite little collection of French, British and Spanish art off 5th Avenue and it was here he spoke of the relationship with J M W Turner. There were foreign films to see. The long, long climb up the Statue of Liberty, the boat trip around Manhattan - and back to endless talks about music. Did you know he had studied a short time under Ralph Vaughan Williams. You are probably aware that pilots were not allowed to bring instruments while training. So Bob borrowed a violin wherever he went in Canada and I do remember he played with the Orchestra in Winnipeg. He didn’t really have much time and yet acquired so much knowledge in that short, young life. He impressed us all with his quiet ways - with a touch of sadness, looking back, I know he had a premonition and when the letter arrived from Muriel in 1945, I would not open it - my Mother did and we learned about his death. Clare later married a Dr Bourne but continued to keep in touch with Bob’s family. On returning to England, Bob joined the 13th OTU at Harwell in November 1944 with Pilot Officer George Thirwell as his constant 2nd Pilot on bombing sorties. On 5th February 1945, they were transferred to 2nd Tactical Air Force, 605 Squadron at Hartford Bridge, Hampshire, Bob as a General Duties Pilot, from where, flying a Mosquito, they went on ten more successful bombing missions over France and Germany. Bob and Pilot Officer Thirwell made their eleventh and last flight with 605 Squadron as part of Operation Clarion on 22nd Feb 1945 - Allied Air Forces launched, a concerted effort to wipe out all forms of transport available to the Germans in 24 hours. Nearly 9,000 aircraft, operating from bases in England, France, Holland, Belgium and Italy attacked over 250,000 square miles of territory, targeting railways, bridges, ports and roads. 605 Squadron provided 19 aircraft of which Bob’s Mosquito, when returning from this operation in daylight, was shot down by heavy anti-aircraft fire over Eggerhausen. Death was presumed at the age of 21, is recorded in Bob’s RAF log book. Bob is buried in Reichswald Forest War Cemetery, near Kleve, Germany in Coll grave 14. E. 1-3. His name is also on the Town War Memorial at Letchworth Station, the memorial in St Mary's graveyard, Old Letchworth and Warwick 605 Squadron Roll of Honour. A very brief account of Bob’s record is also contained in the University of Aberdeen Book of Remembrance. After the War, Bob’s parents received the following communication. "The Under-Secretary of State for Air presents his compliments and by Command of the Air Council has the honour to transmit the enclosed Awards granted for service in the war of 1939 - 45.